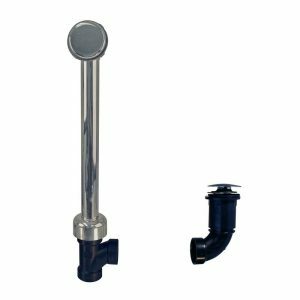 This fully finished bath drain plug features a tip-toe drain mechanism to easily open and close your tub drain. Push stopper to open the drain. Push again to close. Available in a variety of finishes, this item is sure to complement your existing decorative fixtures. Fits 22 in. rough-in. The is waste and overflow comes standard with the Andrea, Annette, and Mitra models. This waste and overflow is fully finished on top, using 1-1/2 in. O.D. brass tubing, with Sch. 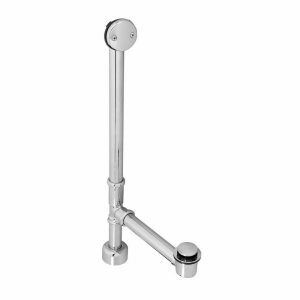 40 ABS bottom fittings designed for bath tubs with skirts and bases. The illusionary overflow cover, cleanly finishes the interior of the tub, while the extended tip-toe, full mushroom cover, fits both standard and extra-deep composite tubs. Glue fittings and pipes provide the ultimate in adjustability. This waste and overflow comes standard with the Daniela model.